Lost, did someone say LOST? 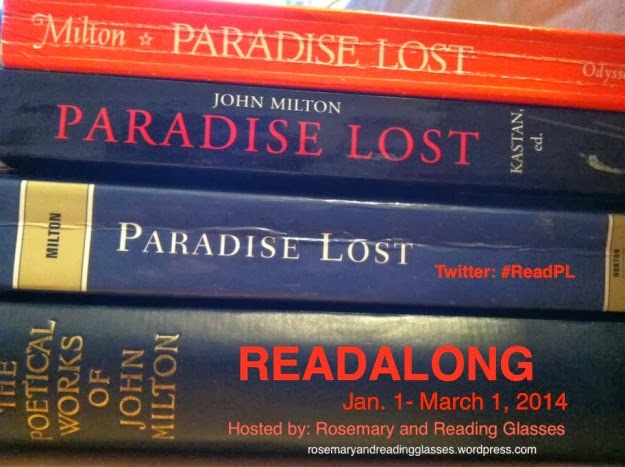 Well, actually I'm not as lost as I thought I would be while reading this magnificent epic poem written by John Milton for my Paradise Lost Read-Along. Wow, where do I begin? I absolutely love this poem. Why? I love the compellingly beautiful and haunting imagery; how each word is not superfluous but enhances the story; the ideas that are both obvious and subtle; the development of the characters which Milton paints with a fine-pointed brush; the echoes of other great poets and great ages, Biblical images mixed with classical ones ……. I could go on and on. 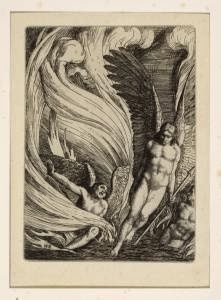 To give a short summary for Books I & II, Milton calls upon his classical and spiritual Muse to introduce the poem, relating the disobedience of man, and then dives right into Satan's fall from Heaven after a battle, the Consult in Pandemonium where Satan and his angels decide their next tactic and Satan's journey to earth with the purpose of ascertaining whether they can exert their influence there to revenge themselves on God. Interestingly, Milton creates a Satan that is both appealing and evil, a fascinating and unsavory character, so I'm going to concentrate my comments on his and his minions machinations! If we listen to the words of Satan and his angels describing their plight, they sound compelling, at times even justifiable, and perhaps one could even feel a sympathy for them. And what else is not to be overcome? Yet there is a delusional quality to their reasoning and, if we listen to the poet, we see that their hope is futile against the power of God. Even Belial, the fallen angel, seems to confirm this premise. Though they admit they have lost happiness and prestige, the hatred they harbour towards God is like a putrefying emination, and their diabolical desire for vengeance is at once powerful and terrifying. There is a sense of a lack of humanity, a disconnect to any emotion other than overwhelming enmity towards the Creator. Satan even exhibits a curious impersonal indifference to man, seeing him only as a vehicle to play out his revenge. In spite of evidence to the contrary, Satan and his followers are certain of victory, and plan to work relentlessly towards that goal. Milton does not make Satan an horrific, evil monstrosity; his Satan is articulate, calculating and, in the eyes of the other fallen angels, has admirable artifice. While the Satan of Dante (The Divine Comedy) is gruesome, hideous and quite terrifying, our Satan in this poem has a more pleasing guise. And so he should have. Dante's Satan was in Hell, evil personified, there to enlighten inmates as to the horrors of their fate. On the other hand, it is important for Milton's Satan to be appealing. He travels to earth with the design to tempt men; his deviousness and evil require cloaking in order for him to succeed in his mission. But for us as readers, it pays to be diligent in recognizing the true qualities of Satan and the fallen angels. They value power, might, ill, revenge, war, strength, vice, hatred, death, and they despise weakness, goodness and virtue. In fact, they don't simply despise good; they seek to pervert it, and far from wishing to do ill to a specific person or for a specific wrong, they desire "ever to do ill." The trick is to see behind the facade. To trust anything presented or said by Satan and his angels would be unwise. 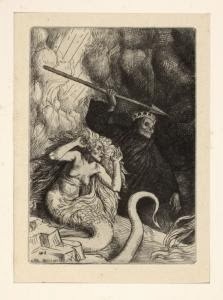 Book I and II were ripe with an incongruous tension between the grandeur of Satan, and his evil scheme of vengeance, paired with the futility of his actions. I cannot wait to see what transpires in Books III and IV! OK, I only read a children's version of this to my kids last year, (yes, they have a great kid's version), but I cannot wait to read this in its original form. I love the description of Satan - how appropriate, given that he and his ways are supposed to be highly attractive to us. Oh Ruth, you have to read it! I'm hesitant to use the word enjoyable but it is! I wish I was able to read a portion and then re-read it again (effectively reading it twice), as I think it would be even more illuminating. This poem is packed with so many things that it would be nice to take the time to really absorb it well. I didn't know there is a children's version of Paradise Lost. I had my daughter read a children's version of The Divine Comedy and it was excellent too. Oh my, how did I miss reading this for so long? !